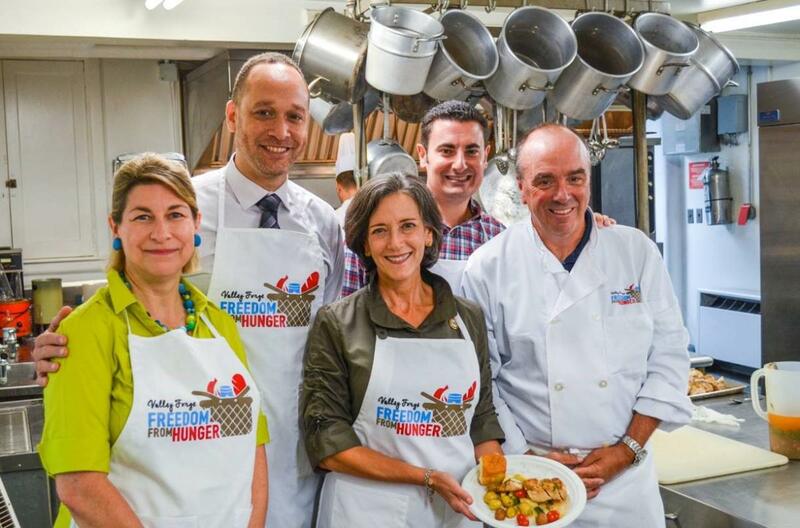 KING OF PRUSSIA, PA – The Valley Forge Tourism & Convention Board’s (VFTCB) fourth annual Valley Forge Freedom from Hunger Food Drive has exceeded a record goal of 5,000 pounds to collect more than 5,300 pounds of food donations. The food drive took place during the last two weeks of September. The VFTCB has increased its goal for donations every year since the drive began in 2015 and to date has collected more than 14,000 pounds of food to feed the hungry in Montgomery County, PA. The food drive collected donated canned goods at various drop-off locations throughout the county, as well as online monetary donations. The VFTCB kicked off this year’s drive by lending a hand to help underserved individuals at a Norristown community food shelter. A former executive chef, Bowman, worked alongside Montgomery County Commissioners and Culinary Arts Institute at Montgomery County Community College members to cook an afternoon meal for between 100 and 150 people at Haws Kitchen, located in Haws Avenue United Methodist Church in Norristown. Custard dessert was generously donated by Shake Shack King of Prussia. This year’s donations will help support kitchens like Haws, which is good news to Mary Alice Laws, who started the Haws soup kitchen in 2000 with two teams serving freshly cooked meals every other Sunday. Now, 10 teams of church and community members serve each Sunday – that’s 6,000 people a year, including veterans, and children, she said. Last year, the VFTCB collected more than 4,800 pounds of food donations and exceeded the Board’s goal by more than 300 pounds of food. This year, the VFTCB also partnered with one of the newest breweries to be opening in Montco – and the only craft brewery in King of Prussia – Workhorse Brewing Company – on a local beer series, featuring a new brew each quarter, that will be branded using the help of area artists. A portion of the proceeds from the sales of that beer went to the food drive. The VFTCB also partnered again with the MontCo Anti-Hunger Network – a coalition of 30 food pantries that helps feed 15,000 Montgomery County households a year. The dollars generated by the Valley Forge Freedom from Hunger Food Drive is going to help nourish just some of the 77,000 people who are food insecure across Montgomery County. The VFTCB’s Valley Forge Freedom from Hunger Food Drive was also recognized with a 2018 Communitas Excellence in Community Service Award, and a PR Daily CSR Honorable Mention Award. To learn more about the drive, visit www.valleyforge.org/hunger.